The NVRC will build upon and advance Syracuse University’s already strong national leadership in the veterans’ community, and serve as a class-leading exemplar of academic, government and community collaboration. Today, Syracuse University announced the launch of an international design competition aimed at identifying a world-class partner to conceptualize, design and construct the new National Veterans Resource Complex (NVRC). The NVRC will be a first-of-its kind facility in the United States and will leverage a public-private sector partnership model to advance academic research, programming, and community-connected innovation serving the social, economic, and wellness concerns of the nation’s veterans and families. 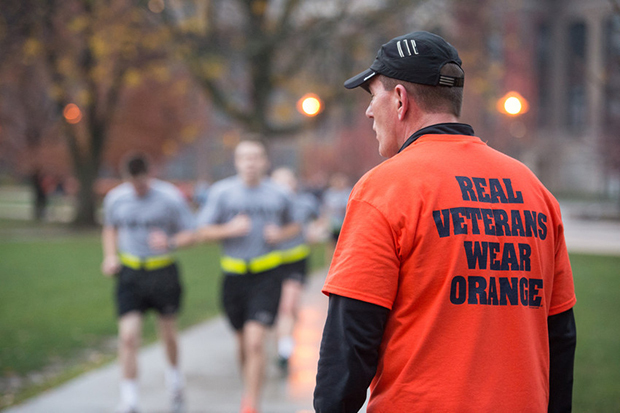 The NVRC will build upon and advance Syracuse University’s already strong national leadership in the veterans’ community, and serve as a class-leading exemplar of academic, government and community collaboration. The NVRC is a key pillar of the Central New York (CNY) Regional Economic Development Council’s winning proposal titled “Central New York: Rising from the Ground Up.” The CNY proposal was one of three selected to receive $500 million as part of Gov. Cuomo’s Upstate Revitalization Initiative (URI). Under the Governor’s leadership, this initiative has made an unprecedented level of funding available to Central New York and regions across upstate to create new jobs and new opportunity. Chancellor Kent Syverud, who serves as co-chair of the CNY Regional Economic Development Council, says the URI award will revolutionize the region’s economic trajectory. To facilitate the design competition, Syracuse University has asked Martha Thorne, dean of the IE School of Architecture and Design in Madrid, to lead the search for the University’s design partner. Thorne, who also serves as the executive director of the Pritzker Prize—the architecture equivalent to the Nobel Prize—will collaborate with the NVRC Design Selection Committee, to invite 30 of the world’s leading architecture firms to submit their qualifications to be considered for the architectural, landscape, and engineering design of the NVRC. To ensure all perspectives are represented, the selection committee is comprised of faculty, staff, students, and design professionals. The members of the committee are Andria Costello Staniec, associate provost for academic programs; Julia E. Czerniak, associate dean of the School of Architecture; Steven L. Einhorn ’64, ’67, Syracuse University Trustee and School of Architecture Advisory Board Member; Jared Grace, graduate student in the School of Architecture and Army ROTC Cadet Battalion Commander; J. Michael Haynie, vice chancellor, Veterans and Military Affairs and executive director, Institute for Veterans and Military Families (IVMF); Breagin K. Riley, assistant professor of marketing in the Whitman School of Management; Peter Sala, vice president and chief campus facilities officer; and Michael A. Speaks, dean, School of Architecture. The NVRC, a truly multi-use facility will serve as the enduring home of IVMF, the nation’s leading academic institute focused on the concerns of America’s 22.8 million veterans and families. Additionally, the NVRC will house state-of-the-art vocational and educational programs designed to advance the economic opportunity of the nation’s veterans and military families, as well as seed the conditions for future growth and new employment opportunities for the region and the more than 206,000 veterans and military-connected families who call CNY home. “Not only will the NVRC play a transformative role in providing educational access to veterans and their families, but its strategic location will play a pivotal and transformative campus planning role in achieving Syracuse University’s master planning goal of creating and reinforcing a dynamic campus-city community,” says Einhorn. The NVRC is tentatively planned for the western portion of the Waverly block on the Syracuse University campus. It will also house the Syracuse University and Regional Student Veteran Resource Center; the Army Reserve Officer Training Corps; the Air Force Reserve Officer Training Corps; U.S. Department of Veterans Affairs Vet-Success on Campus; the National Center of Excellence for Veteran Business Ownership; Veteran Business Outreach Center and Accelerator; and Syracuse University’s Office of Veteran and Military Affairs. The NVRC will include classroom spaces to accommodate local and national veteran-focused programming, along with a conference center and 1,000-seat auditorium suitable to host community activities, lectures and national convening events and conferences. The facility is also expected to include gallery space exhibiting the University’s storied legacy of serving America’s veterans. The gallery will also serve as a venue to highlight present-day exhibitions of art, culture and performance relevant to the veterans’ community. Designed as a LEED-certified facility and constructed in accordance with Universal Design practices, the NVRC will be an inclusive facility that welcomes and accommodates veterans and visitors with disabilities. Upon receiving qualifications from the 30 firms, the selection committee will invite a smaller group of firms to submit design proposals. The first round of firms will be selected and notified by mid-January 2016. Finalists will then be invited to visit the site and speak with campus representatives about the history, goals, vision and timeline for the new facility. On April 11, the finalists will hand in materials related to their basic design for the project. They will appear on campus to present their proposals to the selection committee in late April. The winning proposal and firm will be announced in May. For more information on the project, to submit ideas and to ask questions, visit http://NVRC.syr.edu. Ongoing updates regarding the project’s progress will be posted there regularly throughout the design competition process.